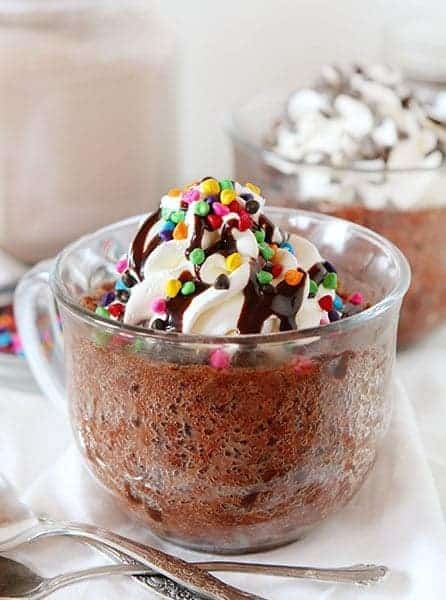 Delicious chocolate cake made in a mug and ready in just one minute! 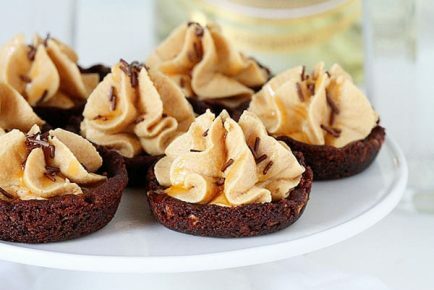 If you love amazing desserts, don’t miss my Cake Recipes and 50 Best Cookie Recipes! Have you ever had a craving for chocolate cake but didn’t feel like making a whole cake? Have I got a solution for you! 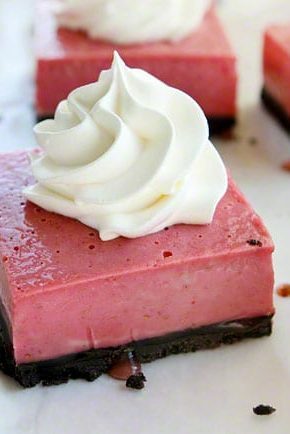 This easy recipe is cheap, FAST, and super delicious! 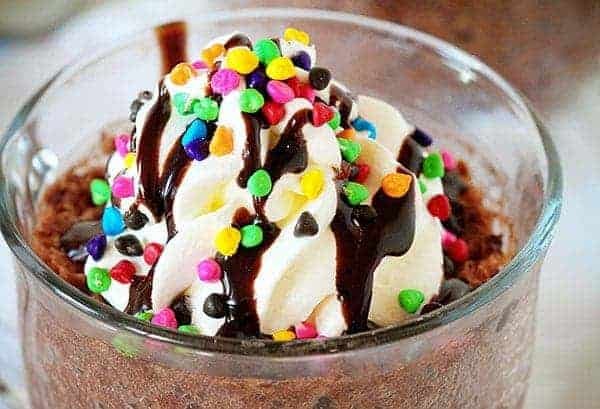 I like to make a big batch and store it so I have something yummy for when the craving strikes! One box angel food cake mix. One box any flavor cake mix. (I prefer chocolate) Combine. Use some immediately then store the rest in your pantry. And yes it is that easy! But lets get real about a couple of things. 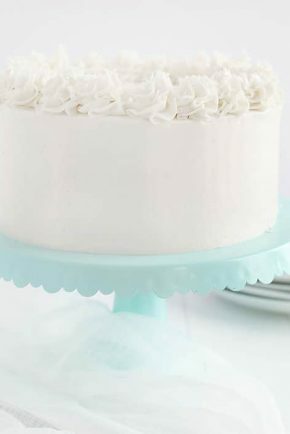 This cake does not compare to a homemade Perfect Chocolate Cake. Or a Homemade Yellow Cake. Or any from-scratch cake that you make. What is does, quite beautifully actually, is serve a craving. It’s chocolate. It’s hot. It’s quick. It’s a small portion so you don’t have to add ‘major guilt trip’ to your list of daily tasks. 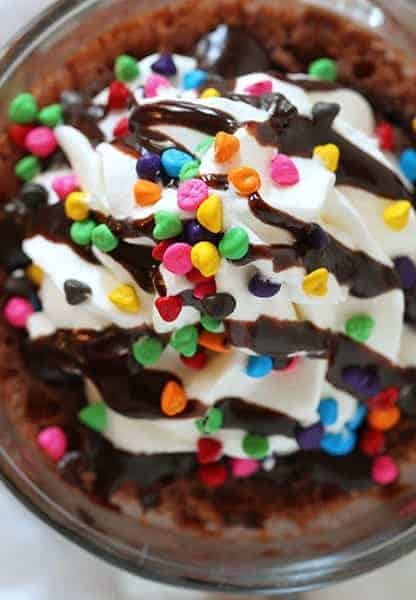 I experimented with a LOT of flavors and settled on chocolate cake with mini chocolate chips and massive fun toppings with sprinkles. These are Mini Rainbow Chocolate Chips which is right up there with sliced bread in terms of inventions that make my life awesome. I just want to look at this picture and forget that there is a child climbing on top of my printer and pressing buttons with wild abandon. 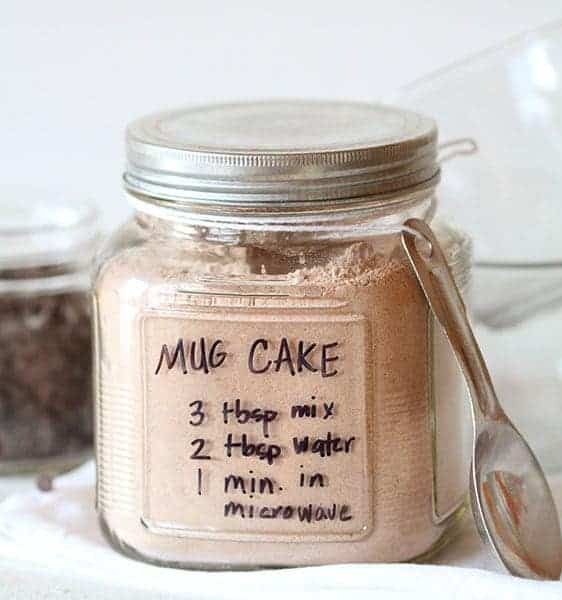 If you want to double the recipe (if you have a large mug as I did) you can. Simply add an additional 10 seconds in the microwave. This sweet treat is a hug in a mug! 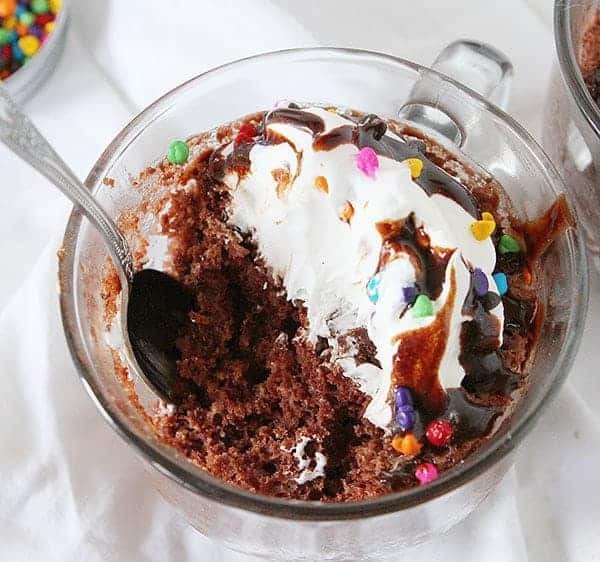 Delicious chocolate cake made in a mug and ready in just one minute! Pour angel food cake and chocolate cake mix into a large bowl and whisk until combined. Place in an airtight container and store for up to six months. 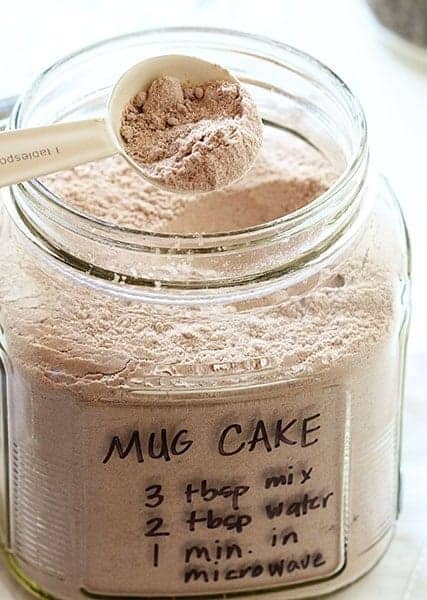 Measure out cake mixture, water and vanilla in a mug and stir to combine. 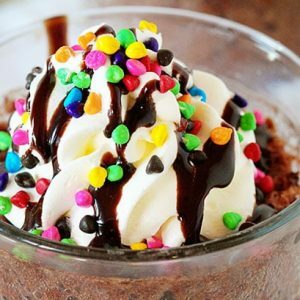 Garnish with whipped cream, chocolate sauce, sprinkles, cherry, whatever suits your fancy! Sounds great! Love watching you cook! Amanda, any way to do this without the angel food mix. Allergy to all egg products. Could milk be used instead of water? 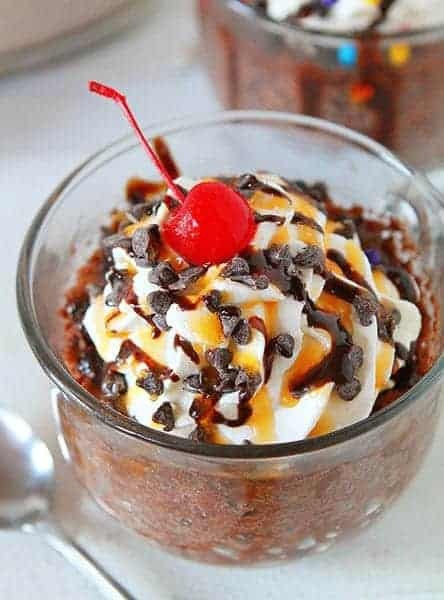 Can you add chocolate chips to the mix? Had with scoop of vanilla ice cream on top.delicious satisfied sweet tooth. I made up the mug mix using devil and angel cakes mixes. WE made a few playing with it and it always seems dry. Suggestions?? 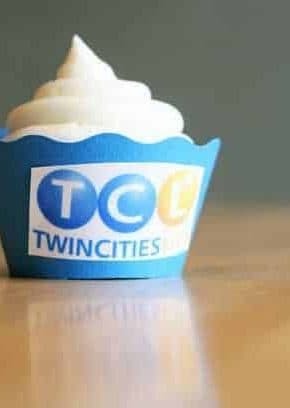 Is there another recipe that gives a soufflé like texture? Thank you for your recipies! I especially like the mug cake! 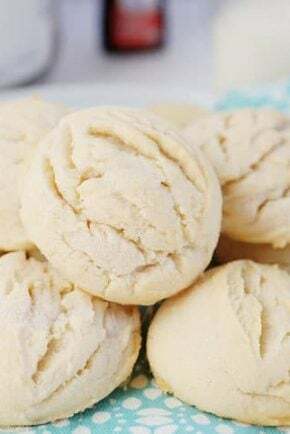 Easy and just the perfect size for your sweet cravings!